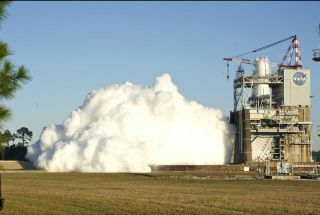 During the 80-second-long J-2X test firing on Dec. 1, 2011, NASA began characterizing the rocket engine's combustion stability. NASA test fired the upper-stage engine of its new heavy-lift rocket Thursday (Dec. 1), marking another step forward in the development of the vehicle that could launch humans toward an asteroid or Mars someday. The 80-second test, conducted at NASA's Stennis Space Center in Mississippi, investigated the combustion stability of the J-2X rocket engine. This engine will power the second stage of the agency's new Space Launch System (SLS) rocket, which is designed to send astronauts toward deep-space destinations. During the test firing, engineers set off a controlled explosion inside the J-2X's combustion chamber, introducing an unexpected pulse of vibration. The test is designed to help engineers learn more about the engine's performance and robustness, officials said. Thursday's test is part of a sustained campaign to put the J-2X through its paces. On Nov. 9, NASA fired the engine for a full 500 seconds, the length of time it would burn during an actual mission. NASA revealed the SLS design in September. The huge rocket will have two stages; the first stage will use five legacy RS-25D/E main engines that helped launch the agency's now-retired space shuttle fleet. Some booster rockets will also likely help the SLS get off the ground. In its early incarnations, the heavy-lift rocket will be capable of lofting about 70 tons of payload. But NASA eventually wants to scale the SLS up to launch about 130 tons to space, officials have said. NASA is developing a capsule called the Orion Multi-purpose Crew Vehicle to sit atop the SLS. Orion could be ready for its first unmanned test flight by 2014, but the heavy-lift rocket won't launch until 2017 at the earliest. The space agency wants the Orion-SLS system to be ready to carry astronauts to deep space by around 2021.